No one is immune to stress, least of all moms. That’s why Debora M. Coty, author of the best-selling Too Blessed to be Stressed series decided it was time to write an edition specifically addressing the stresses and needs in the daily life of moms. 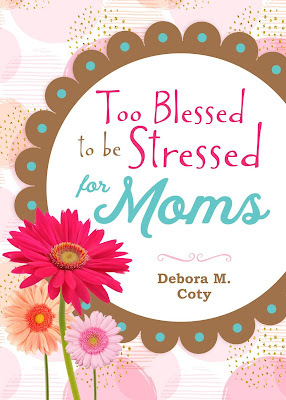 In Too Blessed to be Stressed for Moms (Shiloh Run Press, an imprint of Barbour Publishing), Coty offers empathy, laughs, real-life stories, practical parenting survival tips, and fresh biblical insights to help frazzled moms of all ages hear God’s still, small voice through life’s chaos. Q: When your kids were young, what were some of the biggest stressors for you as a mom? One of my most niggling pet peeves is depicted in this little song I wrote one night while staring at the minefield that was my kitchen floor. It’s sung to the tune of “Three Blind Mice.” Go ahead — sing along. Then just try to stop. I’m standing in the chunks. What can I say? It’s not Taylor Swift … but give her a few years. Q: How do the “shoulds” in a mom’s life cause her more stress? Where does the pressure come from, and how can a mom learn to turn off the pressure valve? · I should go to that parents’ meeting. · I should make the time to bake brownies for my new neighbor. · My mother thinks I should cook a big dinner every night like she did. · I should clean my house, so the kids will stop writing notes in the dust. · I should do more … help more … be more. But as every mother knows, more isn’t always better. Sometimes it’s just overwhelming. You know, we can be whelmed without being overwhelmed. Whelmed is livable; overwhelmed is strangling. We just need to recognize that we truly do have the power to choose which shoulds are potential coulds, then unapologetically embrace the woman our choices make us. 1. Be stress smart. When you’re slammed into a stress mess, take a mom’s time-out. Sit down with a cup of hot tea … close your eyes … tune into Papa God’s heartbeat … feel His peace that surpasses all understanding. Slap guilt to the curb when the tyranny of the urgent attacks; you are important. Everything else can wait a few minutes. I promise you the world will not end while you regroup. 2. Avoid BOOP (Boiling Oatmeal Overflow Phenomenon). I believe women are like pots of oatmeal; at the beginning of the day, we simmer — little manageable bubbles of stress rise to the surface and harmlessly pop. However, as the day progresses, the heat escalates and the oatmeal boils higher and wilder and meaner until it overflows and spoils everything around it with a nasty, ugly, sticky mess. The key to avoiding BOOP is knowing when to remove the pot from the burner. 3. Be a dipstick. The Lord puts only enough fuel in your daily tank for you to arrive safely at the destination He routed out for you. All the detours you add will either run you out of gas or land you in a ditch. Check your tank, review your destination, and then engage in the Three Ps: Prioritize, Plan, and Pace yourself. Q: Why is it so important for a mom to put away her to-do list on occasion and take time for herself? How does this benefit the family as a whole? The old saying is spot-on: When Mama ain’t happy, ain’t nobody happy. Q: We live in a world where we are constantly attached to our electronics. How does being so dependent on electronics as adults influence the physical, social, emotional and spiritual health of the children? Because of our own excessive use of electronic devices in our quest to stay connected, we moms may become unavailable to attend to subtle developmental needs of our children. We’re so preoccupied we assume they’ll somehow figure it out on their own. But it just doesn’t work that way. If we want our offspring to learn crucial life skills in order to become successful adults, we have to intentionally intervene. Physical: Advances in technology have produced a generation of stagnant kids cemented to their (or their parents’) e-devices. Without the stimulation provided by physical activity (play) that helps develop gross motor coordination, improves nervous system function, builds muscle strength, increases stamina, burns excess energy, and controls weight, we end up with a bunch of tech-savvy marshmallows. Smart, but weak and fluffy. To balance the deficit, arrange physical activity for your child at least three times weekly. If you can coordinate play time with other moms and kids, you’ll earn bonus points in social and emotional development too. Social: Chronic use of e-games, mind-numbing movies, and addictive social media produces kids who haven’t a clue how to get along with others, show respect, share, be a gracious winner or loser, use good manners, or fulfill the biblical mandate to build others up (“Encourage one another and build each other up,” 1 Thes 5:11, NIV). The best way to equip your child with lifetime socialization skills is to spend face time together, and I don’t mean the electronic kind. Eat meals together as a family, have tickle fests, pillow fights, silly-string wars, designate a weekly family night and play interactive games like old fashioned board games, cards, and outdoor flashlight Olympics. Do something fun together; laugh! Make these happy romps a loving demonstration of how to honor Christ through interaction with others. Emotional: In this age of constant electronic bombardment of bright lights and loud noise, it’s important that we teach our kids to cultivate silence, productively fill their “boring” downtimes, learn to wait, endure delayed gratification, live in their own thoughts, problem-solve, nurture ideas, and hammer out personal beliefs — all necessary skills for functioning in the real world. We can start preparing our young children to creatively and productively cope with downtime. Delayed gratification can be taught by helping your child set goals and work toward them (i.e. saving money for a new bike or incrementally acquiring skills that take time to master, such as piano) and by scheduling snack times so they don’t graze at will. These are proactive ways to teach patience and self-control. You’re also preparing your offspring for future workplace marketability and coaching them to be financially responsible and live within a budget. Q: What advice do you have for letting go of Mom-Guilt? · Buddy up. Recognize that you’re not the only one lugging those overloaded bags around the airport. Find or form a Bible study or support group of sister-moms; you don’t have to navigate this journey alone. “Resist him [Satan], standing firm in the faith, because you know that your brothers [and sisters] throughout the world are undergoing the same kind of sufferings” (1 Peter 5:9, NIV). · Label your baggage, then lose it. Mom-guilt has many subgroups: nursing versus non, working versus stay-at-home, daycare choice, mode of discipline, DIY remorse, Pinterest inadequacy, birthday party inferiority, pressure to join, to name a few. We even view our child’s sports performance and academic achievement as reflections of our mothering. So, give it some thought. What is the source of your nagging guilt? Own it. Ask forgiveness, if need be. Then drop it. Now leave it down there; do NOT pick it back up. Trust that Papa God can and will redeem your poor mom-choices. It’s called grace. “And the God of all grace, who called you to his eternal glory in Christ, after you have suffered a little while, will himself restore you and make you strong, firm and steadfast: (1 Peter 5:10, NIV). · Shake the mental Etch-a-Sketch. So, you screwed up. Again. Who said you have to be Supermom to prove your worth? Certainly not Papa God — He doesn’t ask for perfection; He asks for humility. And if you’ve been a mom more than one day, you’ve got plenty of that. Don’t let the mistakes of yesterday ruin today. You get to start over! “Don’t copy the behavior and customs of this world, but let God transform you into a new person by changing the way you think. Then you will know what God wants you to do, and you will know how good and pleasing and perfect his will really is” (Romans 12:2, NLT). Q: What other books and companion releases are available in the Too Blessed to be Stressed product line? · The award-winning 365-day devotional, Too Blessed to be Stressed: Inspiration for Every Day. · Too Blessed to be Stressed 3-Minute Devotions for Women offers short, pithy snippets for women on the go to start the day out with Papa God. · The Too Blessed to be Stressed Cookbook offers more than 100 stress-free recipes, each requiring less than 20 minutes’ hands-on prep. · There is a Too Blessed to be Stressed Coloring Book with beautiful images and inspiring scripture to enable you to color your way to calm. · Each year there is a new edition of the Too Blessed to be Stressed Planner. It is a purse-sized planner and chockfull of daily encouragement. It is absolutely adorable! Some of these items are available in Spanish, and even Portuguese. You can find out more about them on my website.